Apply as a preventative treatment prior to infestation. Make the first application at foliar emergence and repeat as needed (usually 3 – 4 weeks) to maintain the repellency effect. If a strong infestation exists mix per above and spray every 2 – 3 days until insects are under control, then maintain on the 3 -4 week cycle. AllGuard naturally repels insects and keeps them away from your fruits and vegetables. Category: ALLGUARD® ORCHARD & GARDEN SPRAY. Applications: Apply as a preventative treatment prior to infestation. Make the first application at foliar emergence and repeat as needed (usually 3 – 4 weeks) to maintain the repellency effect. If a strong infestation exists mix per above and spray every 2 – 3 days until insects are under control, then maintain on the 3 -4 week cycle. AllGuard naturally repels insects and keeps them away from your fruits and vegetables. It active ingredient is Garlic Juice which contains natural sulfurs and is responsible for its repellent properties. 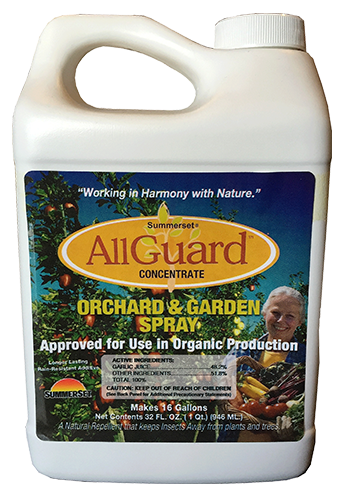 Summerset AllGuard Concentrate is a highly concentrated Garlic Juice that is specifically blended with a rain-fast additive that will keep repelling insects from your fruit trees, orchards, vegetable gardens, flower gardens, and turf grasses (lawn) longer. No other stickers or adjuvants are needed. Just add water. It leaves no garlic taste on any fruits or vegetables and the odor of garlic will disperse in about 30 minutes. It is suitable for use in organic farming.